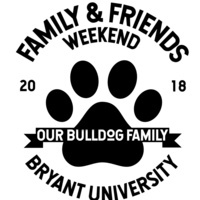 Bryant University and Student Government invite you to join us for a weekend of exciting events during our 2018 Family and Friends Weekend celebration. This annual celebration is a great opportunity to reconnect with your Bryant student, to take in our vibrant campus life,and enjoy Rhode Island. You will be able to view the event schedule on Guidebook closer to the date of the event by downloading the Guidebook app, and searching for the "Bryant University New Student Programs" guide, and selecting Family and Friends Weekend.